For hundreds of years, the overwhelming majority of European and American homes have been built using the same structural formula. Standard construction is done with 2×6 or 2×4 wood framed walls, with posts and beams over openings. There are some new techniques however, that are becoming more common. Two of these are Insulated Concrete Forms (ICF) and Structural Insulated Panels (SIP). The ICFs are the Lego© like blocks, which you stack up, and then fill with concrete. Think of the SIP’s as an insulation sandwich, where a block of foam insulation is set between two pieces of plywood, or OSB (the wafer board like material that also comes in 4’x8’ sheets). Both ICFs and SIPs make for strong, efficient and quite structures. In this post, I’ll try to enlighten you a bit about SIP panels so that if you’re thinking about using them for new home you’ll have a better understanding of what they are, how they can be used effectively and efficiently, and when to start considering them. SIP Panel roof on top of SIP panel walls makes for extreme efficiency. SIPs are made in a factory under controlled conditions. Expanded Poly Styrene or EPS is used as the core of the SIP. The thickness of the foam matches the thickness of the wall. A SIP for a 2×6 wall would be 5 ½”thick. A panel of either plywood or OSB is glued to each side of this foam core, and with the proper temperature and pressure applied; a super strong bond is formed. The OSB panel will extend beyond the edge of the foam slightly, to allow for attachment to the basic framing members. SIP’s are usually 4’wide, and generally 8’long, but can be made up to 20’ in length. They can also be manufactured to any specific sizes to create a custom one of a kind structure. What are the advantages of SIP panels? There are many. SIPs are great for insulation. The EPS foam has an R value of 3.85 per inch. R value is a measure of materials resistance to heat transfer. The higher the R value, the better insulator it is. A 2×6 wall with standard fiberglass insulation has an R value of R-19. A 2×6 SIP panel has an R value of R-23. This may not sound like much of a difference, but add in the fact that there is less conductive heat loss thru the framing members, and no gaps in the insulation as is normal with fiberglass batts, and the SIP’s overall performance is much better. They are also very good at sound insulation. We built a SIP panel house for a client in an area subject to high winds. After a strong weather event, he would ask “Did you hear that wind last night? Well, I didn’t”. The structural strength of SIPs is also very good. Shear is the lateral or sideways strength of a building. Having a solid panel on both the inside, and the outside, makes for a tremendously strong structure. The structural engineers love SIPs. SIPs are an efficient use of materials. There is very little job site waste. Lastly, SIP panels can save a lot of time when erecting a house. A base plate is attached to the subfloor around the perimeter of the structure. The SIP simply slips over, and is nailed to this base plate. Vertical members are installed on the ends of the panels, where they are attached to other panels. Openings are left for doors and windows. Time savings for onsite erection of a SIP panel house versus a stick frame house will vary according to the complexity of the design, but the SIP house can be built much more quickly. SIP panels can be used for the floors and roofs, as well as the walls. Although SIPs can be a more efficient way to build a house, their use is not optimal for all designs. Houses with many small window openings, or numerous corners, making for few large wall areas, are not the best for panelized construction. 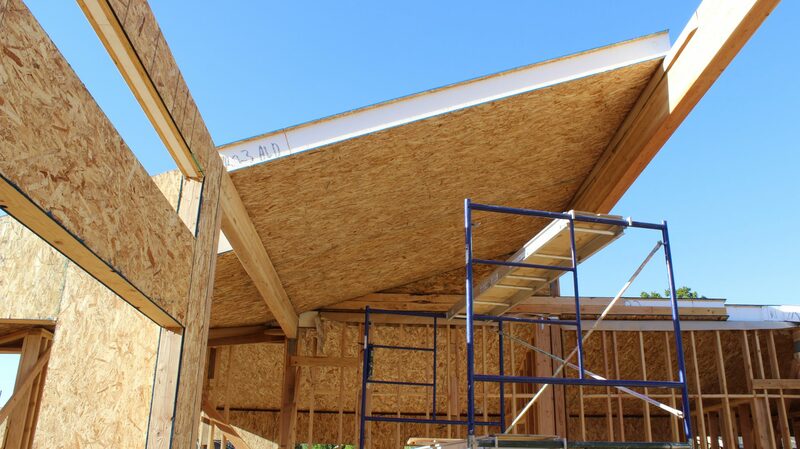 SIPs become more cost effective when larger sized panels can be used more often. The use of SIPs should be considered while in the design process, not added as an afterthought. With proper design and installation, SIPs can save both time and money, while providing for a stronger more efficient building. If you have any questions or comments regarding SIP Panel construction, please join the discussion.